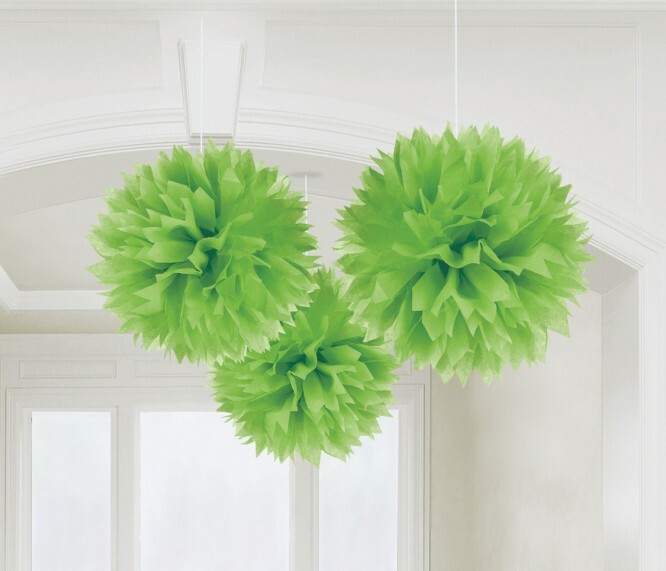 Deck out your party space with our Kiwi Green Fluffy Decorations! These paper decorations arrive flat but bloom into round tissue paper flowers. Unfold and fluff up the paper layers until they look like voluminous carnations. Mix and match with themed or other solid color decorations for your birthday, holiday, graduation or sports party! Deck out your party space with our Kiwi Green Fluffy Decorations! These paper decorations arrive flat but bloom into round tissue paper flowers. Unfold and fluff up the paper layers until they look like voluminous carnations. Mix and match with themed or other solid color decorations for your birthday, holiday, graduation or sports party! Kiwi Green Fluffy Decorations product details: 40 cm wide, 3 per package, Includes strings for hanging.